You are currently browsing articles tagged tatton flower show. 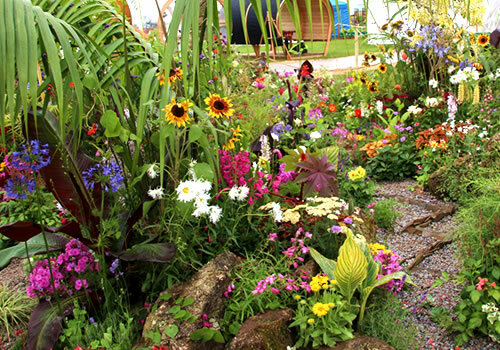 There was so much to see at Tatton, I’ve still got a few gardens to you show from the flower show. This is a special garden as it was designed and created by 50 youngsters from estates across Tameside. 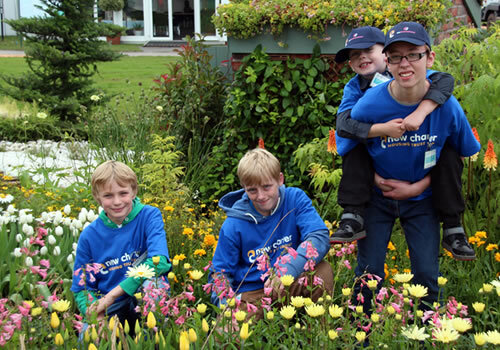 The children worked on the garden as part of Dream Scheme, a community development scheme for children aged 7-16. The circular garden depicts the four seasons, the children were inspired by their favourite things about each season using colour, texture and artwork. They worked with local artist Jacqui Symons to create willow sculptures and mosaics for their garden. 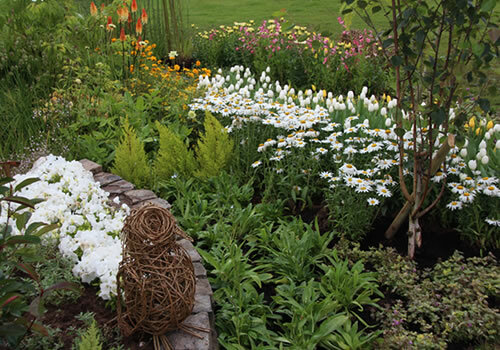 The spring section featured a mosaic path and formal planted beds. They even managed to get some tulips flowering in July. The summer section included a patriotic mosaic corgie and beds of vibrant summer flowers. 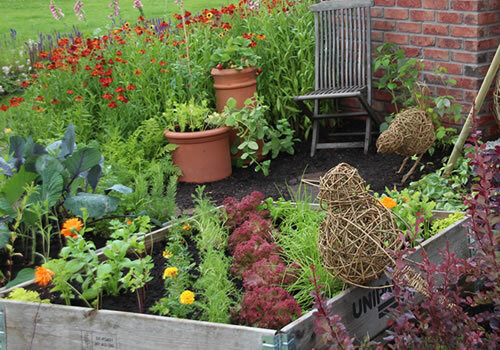 In the autumn section there were raised beds containing vegetables and some bird willow sculptures. 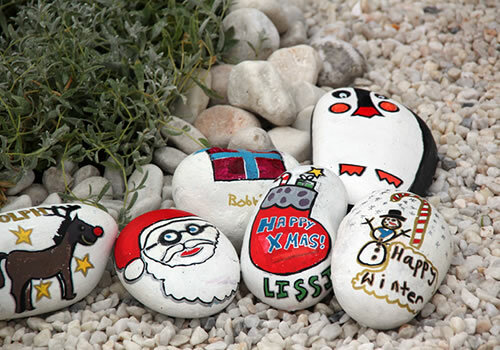 The children made a willow snowman and painted their own stones for the winter section of the garden. All their hard work paid off as Dream Scheme were awarded a Silver Medal by the RHS. 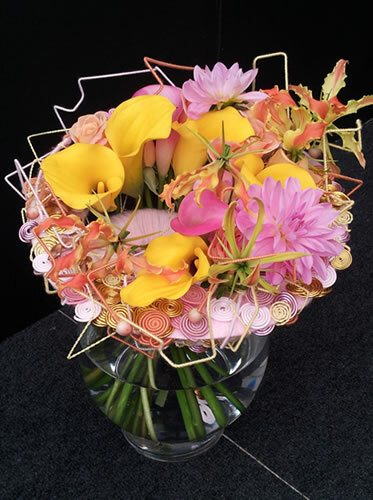 The BFA Young Florist of the Year qualifying heat was held at Tatton Flower Show last week. 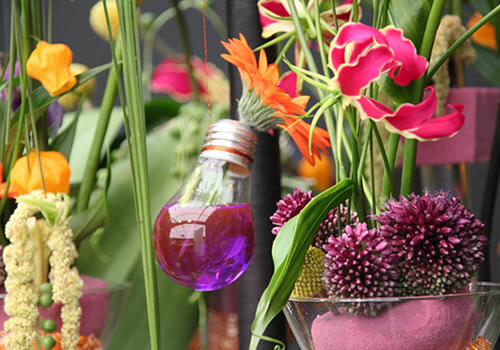 Four talented finalists will now go through to the final at Fleurex which takes place in October. Competitors had to create four innovative designs live in front of visitors, within set timescales. They made a body accessory, hand-tied design, free expression piece and a surprise item all inspired by their theme. Charlotte Baker was the overall winner of the competition. 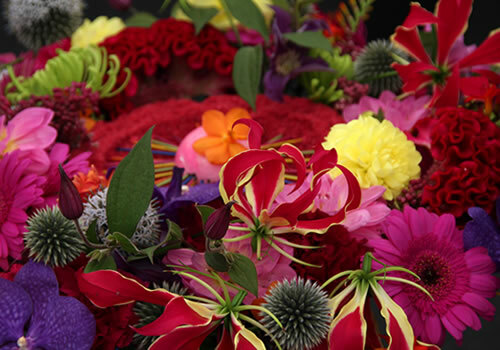 Her vibrant designs used flowers in cerise, purple and oranges. Her free expression piece was an impressive structure made with perspex circles holding the flowers. She used light bulbs and martini glasses as containers. 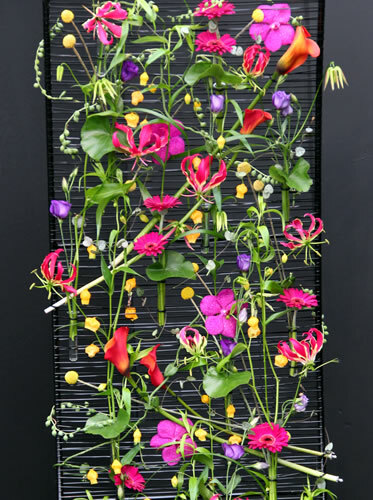 Sophie Watton created a screen for her free expressive piece using used vivid gloriosa, callas, craspedia and gerberas in her designs. 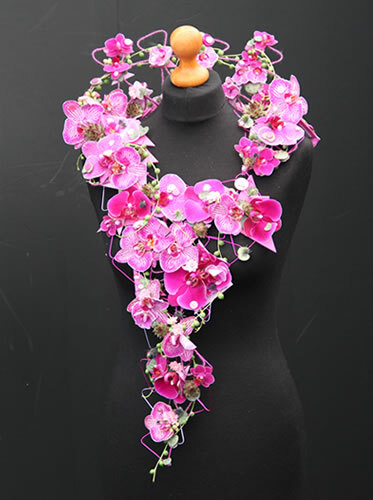 Many competitors made a necklace design for their body adornment piece. 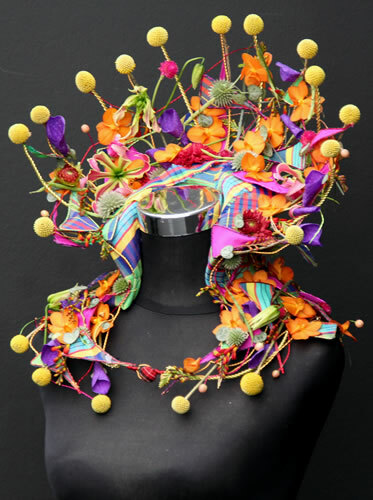 Victoria Richards created a modern take on an Elizabethan collar, in vibrant colours with striped fabric, coloured wires and flowers glued on. 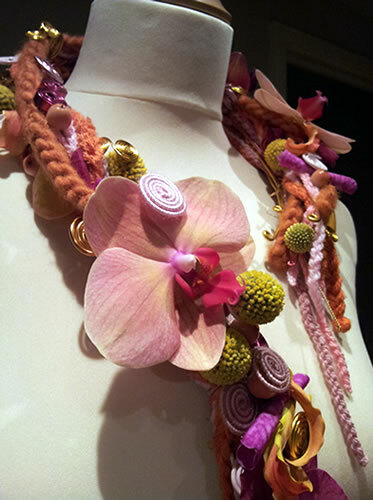 Kirsty Berridge made a beautiful necklace design for her body adornment piece. 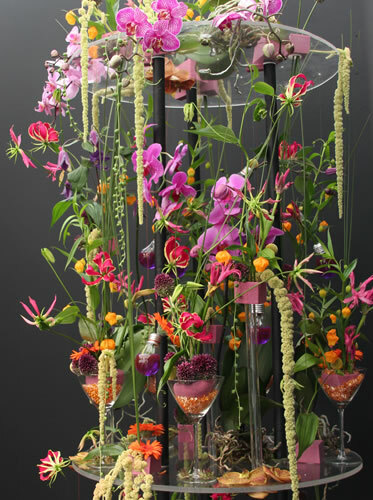 She used phalaenopsis orchids, de-constructed gloriosa, craspedia and hypericum in her design. Kirsty also included some lovely hand braided textiles in her piece. Congratulations to all the finalists, I think you produced some gorgeous designs. 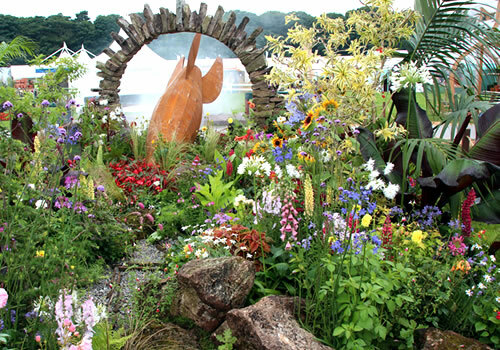 The garden was created by Tatton Park’s gardening team, who have been creating gardens for Tatton Flower Show since it started 14 years ago. 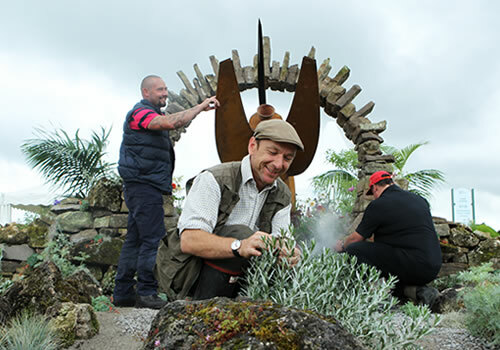 The garden links with Tatton Park’s Art Biennial theme, Flights of Fancy. It is inspired by Maurice Edgerton of Tatton, who was the last Baron of Tatton. He was passionate about plants, exploring and aviation. He collected plants from around the world which were used in the gardens around Tatton Park and he sent plants to other continents. 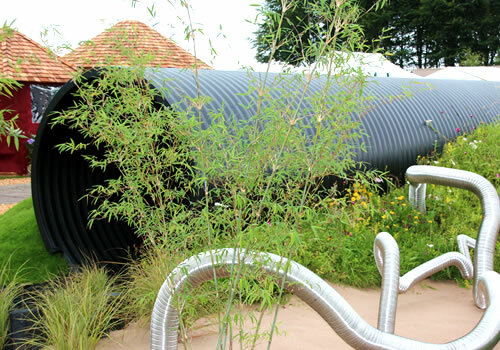 The concept behind the garden is that he sent a rocket into space filled with plant seeds. The rocket crash lands on a bleak planet and the seeds grew into plants that thrive. All the plants used in the garden were part of his collection. The garden is split into two sections divided by a moon gate. In front of the gate the barren landscape only has a few silver and grey plants. Through the gate all the plants from Tatton flourish in bright colours. 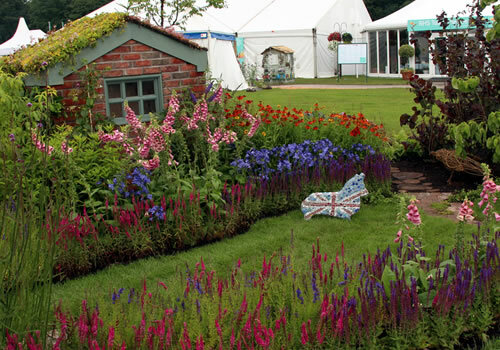 The North West Area of NAFAS created this patriotic design at Tatton Flower Show. 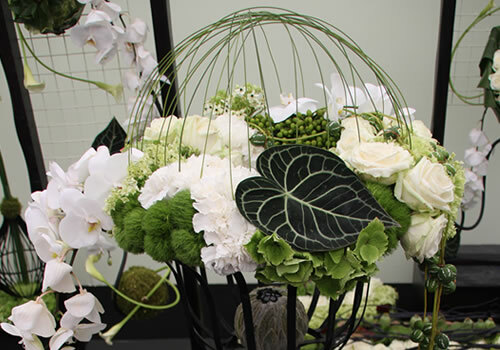 NAFAS stands for National Association of Flower Arrangers, they earned a Silver-Gilt medal for their display. 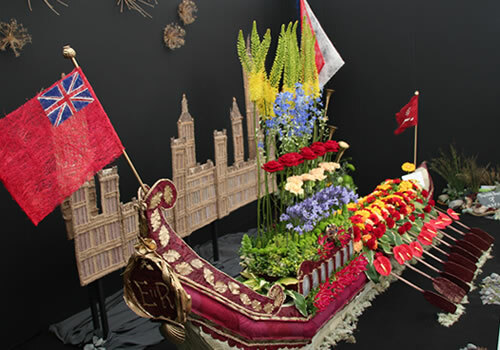 The exhibit depicts the royal barge Gloriana in the Thames Diamond Jubilee Parade, with the Houses of Parliament in the background. 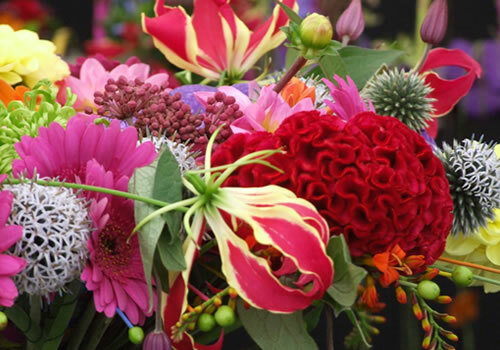 The intricate design in royal red and gold features eremurus, delphiniums, roses, carnations, anthuriums, gerberas and hypericum berries. Hundreds of dried leaves were painstakingly applied to the outside of the barge to create the red paint colour. 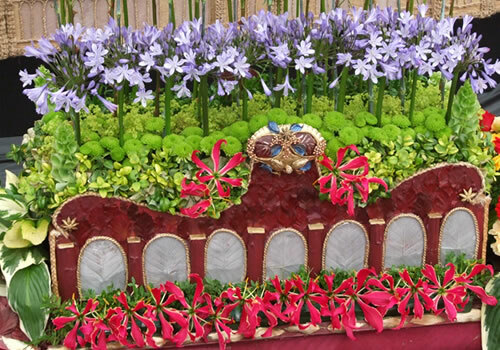 Gloriosa, agapanthus and chrysanths are used in this section of the barge. The Cheshire Area of NAFAS designed a display named ‘to keep thee what thou art, an English home’. 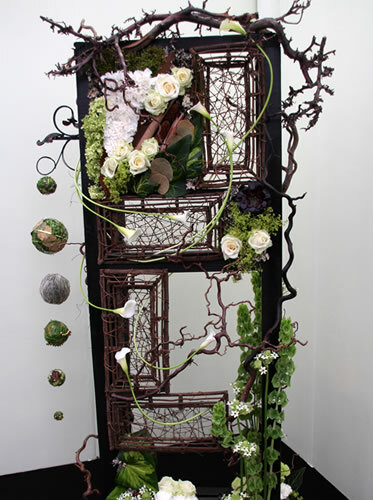 They were awarded Best exhibit in the Floral Design Studio and gained a Gold Medal for their work. 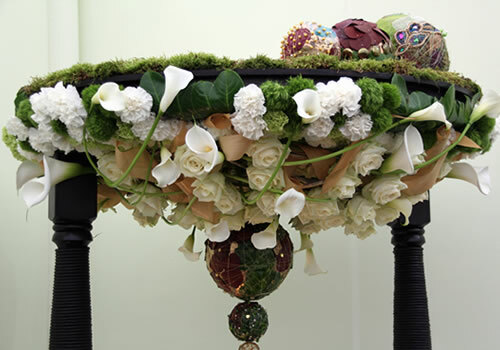 They used mainly white flowers with a touch of green, mixed with lots of earthy brown materials like gnarly branches, vines, pine cones, bark, lichen and dried leaves. 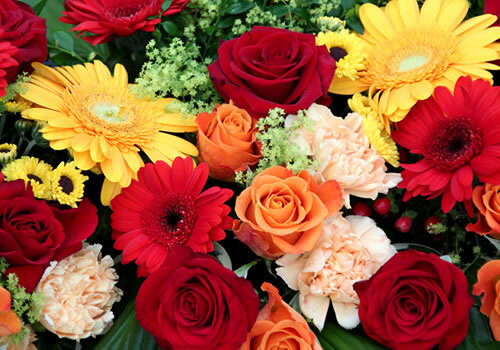 The flowers included calla lilies, roses, carnations, ornithogalum, and gerberas. 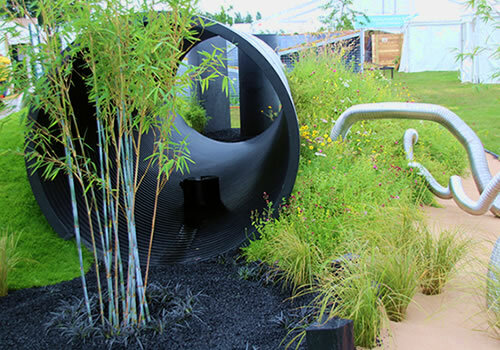 This innovative garden won the award for Best Visionary Garden and a gold medal. 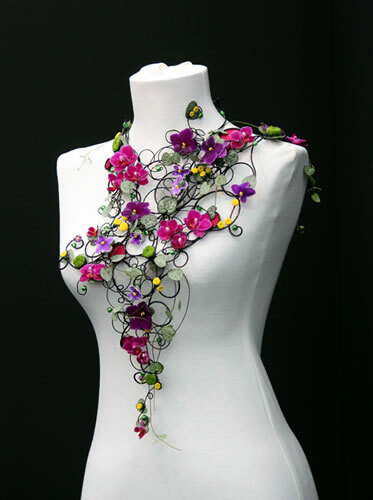 It was designed by Sheena Seeks who has previously won several RHS medals. I found this a really interesting design, and I love the twisted silver pipes. Visionary gardens are experimental and push the push of traditional gardens. Sheena’s garden is inspired by the shape of sound waves and the magical qualities of music. 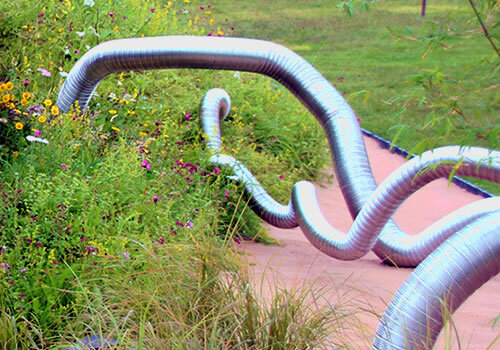 The pipe that runs through the centre of the garden takes you on a journey of air passing through a wind instrument. Untie the wind comes from Macbeth, in which the witches are said to have the power to ‘untie the winds’.